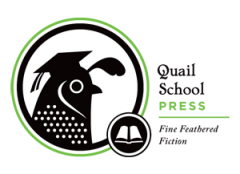 Welcome to Quail School Press, a subsidiary of Quail School Media and an independent publisher of fantastic fiction! Our first book is a critically acclaimed young adult novel called Choose Your Weapon. The start of an exciting new YA trilogy, Choose Your Weapon is a fast-paced adventure that blends together fantasy and reality. Part The Lord of the Rings, part The Breakfast Club, the book follows a quiet Latina teenager from a small Texas town who must work with her high school adversaries to fight dragons in a magical world — without the rest of the school discovering their secret mission. Thank you for your interest in Quail School Press! Copyright 2017, Quail School™ Press. All rights reserved.